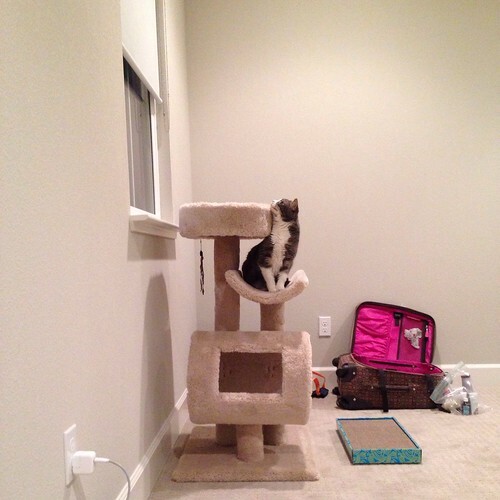 High on the list for our first day in a new home was finding two things—a new cat tree and a good place to have weekend brunch. We had very tasty brunch at Bill's Café and found an ok cat tree at the nearby PetSmart. Toni seems happy with it. We will be going back to Bill's. I will miss the Nutella stuffed French toast at our favorite place in Framingham, but Bill's menu is pretty extensive. Then, I spent the afternoon with a friend from Ravelry (who has furniture). She introduced me to the tastiness of Philz Coffee. Once I was well caffeinated and had ripped out the requisite 6 rows of lace knitting, I ventured to Target for $600 worth of moving in necessities like new bath mats and a countertop microwave. We ended our day with dinner at Terún in Palo Alto with a friend from college. He moved out here from Cambridge right after we moved back to Massachusetts, so we're looking forward to seeing him more often. This morning I located the nearest Peet's Coffee; it's two blocks from my front door. For the next week or so, this is key knowledge since I cannot brave the freeway without coffee. After this week, I will avoid it as much as possible and stick with making my own morning coffee. Our goal for this year of renting is to save money for a nice big down payment and not fritter away our cash on little luxuries. Yesterday, David, the kitties, and I took a one-way flight from Boston to San Jose. We've opened a new chapter in our lives. Late last summer, my company asked me to consider relocating to headquarters. David and I talked about it, I discussed the options with man friends and colleagues, and we decided to make the move. This fall was a whirlwind—we got the house ready to sell, packed many things for staging, and put the house David grew up in on the market. It sold in less than a week; the sale closes on Monday. While all that was going on, we both mostly kept up with our demanding jobs. I hope to blog again to share our new adventures as we settle into this new hometown and new chapter in our lives. For now, thanks to everyone who helped us through the past couple of months. PS. I wrote a much better post on the plane last night, but my iPad ate it, so I'm publishing the short and sweet version.